Did you bite into a piece of food and have a tooth break? Maybe you were enjoying a basketball game and got hit in the face, causing your tooth to fall out? 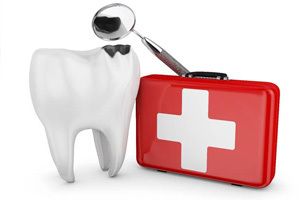 Although you never expect it to happen to you, dental emergencies can occur at any time and without any warning. In fact, one in six Americans will find themselves in this position this year. When the unexpected happens, you need to call your emergency dentist in Ft. Collins right away. At Aspen Dental Care, we will get you into the office right away to save your tooth. No one has the time for a dental emergency to interrupt their day. As a result, you may be tempted to wait to see your dentist; however, time is of the utmost importance. If you wait too long to come in, we may not be able to save your tooth. To save it from an extraction, it is best to call our office right away and then take the necessary steps at home. Knocked Out Tooth: Hold it by the crown and rinse it with water. Do not use any cleaners, scrub it, or dry it. Try to reinsert it back into the socket. If you are not successful, place it in a cup of water or milk. Dislodged Tooth: Gently try to push it back into position and bite on a piece of gauze to prevent it from moving. Broken Tooth: Rinse your mouth with warm salt water and avoid placing pressure on the tooth. If you have pain or swelling, cold compresses and over-the-counter pain relivers can be used to manage your discomfort. Sudden Toothache: This is often a sign of an infection that can spread to surrounding tissues and into the bloodstream. It will require immediate care from your dentist. Lost Crown or Filling: Never try to repair a filling or crown on your own. Instead, place it in a safe area and keep the tooth clean. Avoid chewing on it until after it has been repaired. Home remedies can be used to manage any pain. Broken Denture or Oral Appliance: Never use broken or damaged oral appliances. Contact your dentist to have it repaired or replaced. Although you cannot fully prevent dental emergencies, there are several things you can do to help decrease your risk for one. To keep your teeth strong and healthy, brush them twice a day for two minutes each session and floss every night before going to bed. Do not forget to visit your dentist twice a year for a cleaning and checkup. This allows us to detect potential complications sooner to prevent them from turning into an emergency. If you participate is sports, wear an athletic mouthguard. This will provide a protective barrier in the event trauma or injury occurs to the face or mouth. If you need an emergency dentist, do not wait. Contact Aspen Dental Care today to get the quick treatment you need.